While routine checkups and cleanings make a big difference when it comes to your child’s oral health, it’s also very important to help them maintain a good oral hygiene, first with your (the parent’s) help and then on their own! If you’re unsure what products are best to use, Dr. Danielle is happy to help – as a mom, she only recommends options that would also be the right choice for her own daughters! 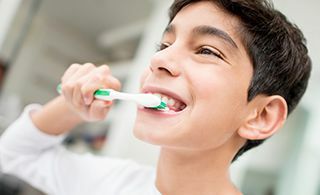 Fluoridated toothpastes are an excellent choice for growing smiles, and parents should take care to only use a pea-sized amount twice a day when brushing the teeth of children who are three years or older. Meanwhile, we ask that you wait until your son or daughter is six or older before establishing a mouthwash routine, as young children may swallow it instinctively. Contact Pediatric Dentistry of Prospect today to schedule your first visit – our Prospect, KY team welcomes patients from Green Spring and surrounding areas!